Patra's Other Place: Now for some GOOD news! New kitchen in the making! This morning we got the phone call we've been waiting for - our builder has confirmed the date for installing our new kitchen - HOORAY!! He said he has just got in the benchtops and will be receiving the cupboard doors soon, and will be able to finish everything off in the factory in the coming week. They will be ripping the old kitchen out on Saturday 24th, and the plumber and electrician will do their preparatory work on that day. On Monday 26th, the new kitchen will be delivered and installed, and again the plumber and electrician will be there to hook up the new appliances. As soon as I hung up the phone, I called Harvey Norman Floors to book a time for them to come out again after the new kitchen is in place, so we can decide on the colour and pattern of the new floor. They will be here on Tuesday the 27th. I love it when everything falls into place like this! So now, I have to start packing up everything in our kitchen. I've been collecting boxes and plastic bins from our opshop and have a huge pile in the spare bedroom. I'm hoping to be able to cull the contents of the cupboards and take a lot of stuff to the opshop that I haven't used for years. I know it's there, but I just needed this shove to make me get rid of it! I've been given some lovely gifts by friends to start off with, and that will motivate me to get rid of the older stuff too. 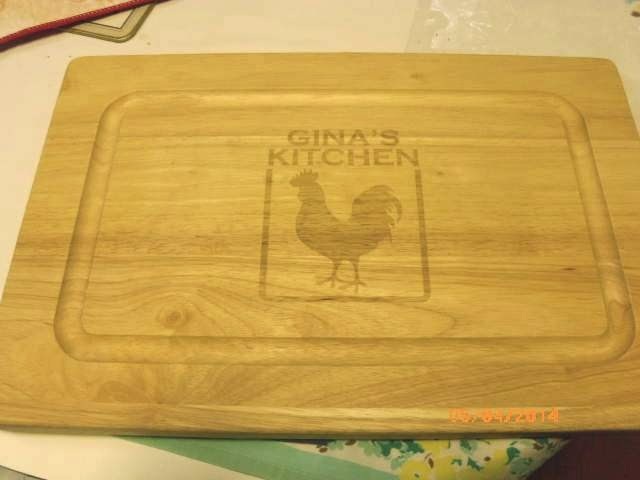 Cheryl gave me this gorgeous timber hand carved cheeseboard that she got made just for me! 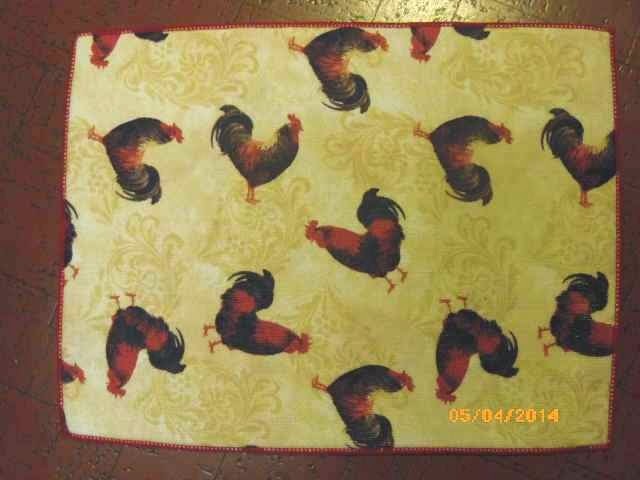 She also gave me this mat with chooks on. It is too small to be a floor mat (and I wouldn't stand on it anyway) so I asked what it would be used for and she said it is to put under the dish drainer on the sink, to soak up drips from dishes. Clever! I also received a pair of glass jars with ceramic roosters on the top from Louise, for my birthday. No photo to post, but once everything is in its new home, there will be lots of pix! !